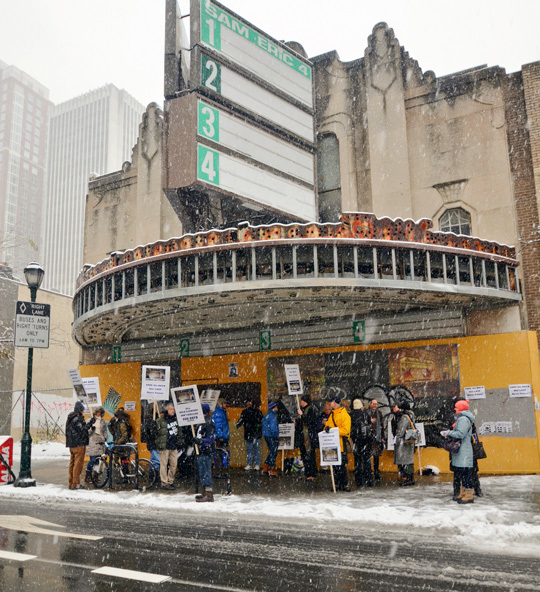 photo by Ben LeechA driving snowstorm was no deterrent for the Friends of the Boyd, who held a rally to save the Boyd Theatre on December 10, 2013. The Boyd, designed by the Hoffman-Henon firm, which specialized in theaters, opened in 1928 as one of Philadelphia's art deco movie palaces. It stayed in operation until 2002, when it was known as United Artists' Sam Eric 4. Since then, the old palace has languished, but that may soon change. Florida-based iPic Entertainment plans to restore the façade, but demolish the interior and replace it with eight screens in a new "luxury theater." Interior of the Boyd, the last remaining movie palace in Philadelphia. Photo by Chandra Lampreich.While the building is designated historic by the Philadelphia Historical Commission, only the exterior is protected from demolition. The Friends of the Boyd hope to also preserve the exquisite interior, the last remaining movie palace in the city. For more on this story, visit the Hidden City Daily, hiddencityphila.org. In partnership with Hidden City, Plain Sights highlights historic structures with compelling stories hiding in our midst.